The Corrupt Commodore Mouse is a breed of mouse found in the Harbour. 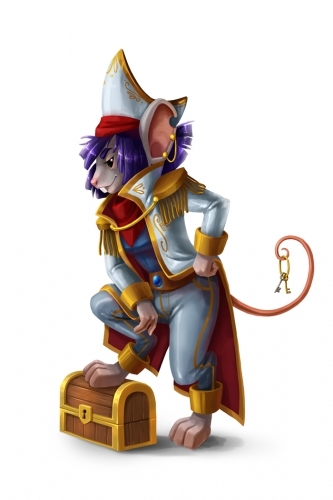 A defector from the Royal Mouse Navy, these mice still wear the fancy outfits and come with advanced nautical training but have switched sides in search of glory and treasure. To be their own mouse and to answer to no one is truly the dream! The Corrupt Commodore Mouse has no specific preference for any kind of cheese. The Corrupt Commodore Mouse drops the Pirate Crew Egg during the annual Spring Egg Hunt. 11 April 2017: The Corrupt Commodore Mouse was added to the game with the introduction of new content to the Harbour location. 17 October 2018: The Corrupt Commodore Mouse changed mouse groups from Aquatic Order to Dock Dwellers.